Whether you're a small private investigation agency or large, established organization, CROSStrax includes all the tools you'll need to easily and efficiently manage your investigative business. 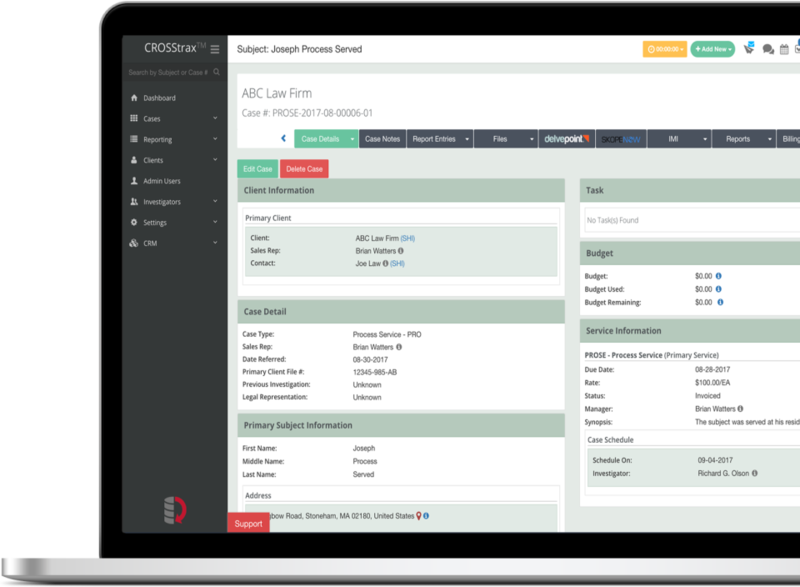 CROSStrax is an affordable, cloud-based case management application designed to streamline the investigation process from start to finish. CROSStrax will assist your investigation business in becoming more organized, efficient, and profitable with less effort. This software saves hours per day! I generate full on reports by clicking a button!! Pros: Time savings and organization. Cons: Takes some time to get started. Overall: First, I called them on a Sunday to leave a message and customer rep got on the phone and spent over an hour answering questions, so customer service is way beyond excellent. 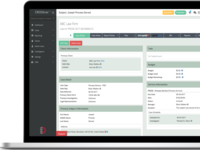 Set up takes a bit because the software is completely customizable for your business and it wasn't always this way (this is my second time around with Crosstrax and they truly made this the best software for managing investigations in any industry. 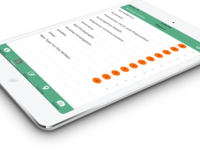 Track your investigators, get notified when their license is about to expire, track your client metrics and provide detailed reports for your client, you name it they have it. I had a client ask if I could track my investigators via GPS on their assignments, the cost was enormous, but not with Crosstrax, they have a real-time GPS app of their own your investigators can sign into. customer rep helped me fill out an RFP for a large company that required secure technology because Crosstrax provides penetration testing results and had a SOC 2 compliance audit done my software, correction Crosstrax, got me on the list. Email case notes and set tasks so you never miss another deadline, integrate with QuickBooks and have your invoices auto dumped from Crosstrax to QB, that alone saves me hours a week depending on how big your company is. I knew I selected the right investigations software when I kindly asked if something could be done different, customer rep said I can't change it but I'll get what you need added. It was added over a weekend! Upload video, audio, documents, photos, add them to your reports through the service notes. A friend turned me on to this and now he is using them too (I was the lab rat!) My client's log-in, there is a bulk case upload feature that is huge for one of my clients, no more spending a day entering 60 cases for small background checks. It was a free trial, worst case I cancel. I'm never cancelling! Recommendations to other buyers: Try it and stick with it! Thank you for your feedback! Customer support is an area we excel, we understand you have a business to run and cannot be without your case management system too run that business. 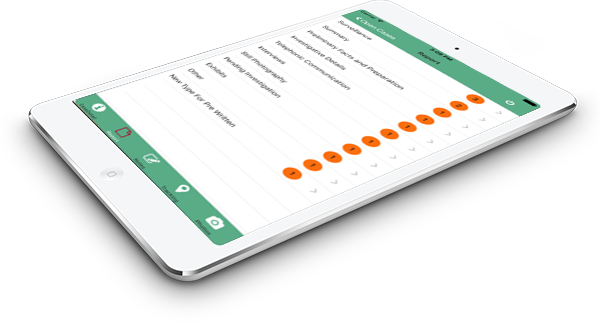 Pros: OUTSTANDING customer support, organization of case information, pre-written templates for report writing, Delvepoint integration, customization, and so much more. I have used CROSStrax since March 2017 and I have seen this software go through many changes but each minor change or feature added, has made CROSStrax go from good to GREAT. 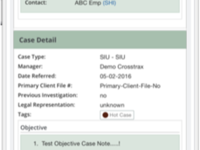 I have tried many other case management systems and CROSStrax is absolutely the #1 software for investigation case management. Cons: The only con is that I didn't find CROSStrax sooner. Oh and Quickbooks integration is only for QB Online. Thank you for your candid feedback. We've integrated with Quickbooks online to take advantage of their financial software. Once integrated, you will have all of the features of QB and CROSStrax together. As we grow, we'll look to integrate with other financial software. If the app is not working for you, call me anytime and we can walk through it, my number directly is (850) 257-8013. Thank you for trusting your data to CROSStrax!! Cons: There are still features that are in development and not working. The area where you can manage how much has been invoice month and year to date does not work. This not a system that you can jump into without support. It's next level case management but it's work in progress. Thanks, Mike. CROSStrax will be an evolving "work in progress". Our promise is to always be as responsive as possible. Thank you for your candid feedback. Pros: The report writing features and the ability to upload video right into CROSStrax. Cons: There is a learning curve but the customer support was fantastic and they were always available. Overall: By getting CROSStrax, I have been able to streamline the report process and my clients get their product much faster. Also, the investigators love it because they don't have to spend hours writing reports and preparing them, the system does that for you. The GPS alone is amazing and I can now run reports to see how my investigators are doing. There's a learning curve but once you have it, it's the way to go. Recommendations to other buyers: This software pays for itself with the Internet mining feature. It searches the Internet for you and then creates the report as well! Thank you for the feedback! So we know reports aren't the most fun part of the job and although we can't eliminate them, we can certainly make writing them that much easier - and we have. Our report writer and generator takes the guess work and long hours away, allowing you to get more done in less time. Pros: Has a lot of changeable options and is flexible. Can handle a lot of data and cases. Billing works well. Cons: Can get confusing when doing multiple assignments / assigning multiple investigators for one client. Thank you for the candid feedback. Now that our features are set and robust, we do need to start focusing on the user experience. Thank you for trusting in CROSStrax! Pros: It's cloud-based and covers every part of the business! Easy to learn, great videos for training, has integrated GPS technology. Thank you for your feedback! CROSStrax was meant to be just that, a comprehensive solution. As we grow, we will continue to add new and innovative tools to make investigations that much easier. Pros: The interface is amazing. It is simple and gets you all the information you need without having to search around for it. Cons: I have not found anything yet. I have used several different case management programs and this is the best thus far. Overall: Impressed with the ease of use and the interface. It doesnt confuse you with information you dont need and has everything you need. You can access everything quickly making it very effective.